My last blog entry was about love. Well, I would like to follow up that entry with an addition. A wonderful example of not letting the world change who you are. 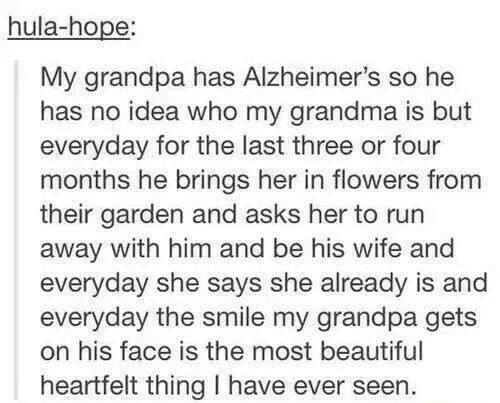 This screenshot made me tear up a little, because it is a wonderful example of love in its simplest most pure form. Allow me to explain why, in light of my previous post. We are flawed, each of us. We are products of our environments, the people around us, how we are raised, how we are treated, the information we learn, the horrors and joys we witness throughout our lives. But mostly, we are a product of our own choices. We CHOOSE to change who we are based on the factors listed above, and more. Who hurt us and how, who we hurt and how, daily nuisances and successes, et cetera. Simply, we are the end result of what we choose to allow to affect us, and how we choose to let it affect us.